This is a simple test of the size of the hand. The size of the hand is advantageous for some sports which involve catching, gripping or tackling. This test is used at the AFL Draft Camp. procedure: The hand is placed palm down on a flat surface. The fingers are outstretched as far as possible. Measure the linear distance between the outside of the thumb to the outside of the little finger. 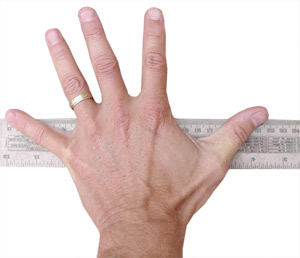 notes: measuring hand span can be used for determining the optimum grip-span for grip strength test measures.